Over 200 million people worldwide live with diabetes. 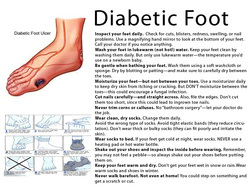 When the disease is diagnosed too late or poorly controlled, it may lead to the possibility of developing diabetic foot syndrome. People with diabetes are required to do more exercising with their "sensitive feet" - such as walking, jogging, and cycling to burn out their sugar level. Well fitted and high quality orthotics along with extra depth therapeutic walking shoes plays a crucial role of protection. Vascular and neurological abnormalities frequently damage the foot. Neuropathy, decreased blood circulation through arteries of the lower extremities, it is very common in a diabetic that wounds do not heal. Custom made diabetic orthotics can help counteract this syndrome before foot ulcers occur or an amputation becomes imminent. Soft materials, shock absorbent and extra cushioned sole creates an ultra-soft footbed with stable support system. Thus protected and minimally stressed, wounds can be prevented/ heal and dangerous infections can be avoided. With all the features and advantages of Diabetic Orthotics, the natural rolling motion is maintained with optional rigid shell material which supports the arch of the foot by absorbing static pressure points and stabilizing the gait of partial amputees. Even with sensitive feet, you now can walk around and enjoy your day in carefree comfort with Custom Made Diabetic Orthotics from Orthotic Concept.